I got ticket #1 to hear oral arguments at the Supreme Court. Yesterday, heady with hope and optimism at the impact our historic case could have on women’s health, the mood changed suddenly when we learned the terrible news from Boston as we were leaving the Supreme Court and wrapping up the rally. I write this recap of yesterday’s events at the Supreme Court with the deep sadness shared by so many. Yesterday marked a pivotal moment in this case that many of you have been anticipating for years. Whether you stood with Breast Cancer Action outside the Supreme Court calling to outlaw human gene patents, cheered us from afar, or stretched your budget to make your biggest donation to support our work—you helped create this historic moment. Let me give you a sense of the atmosphere. Lines to get in were long, I was the first of only 50 or so members of the public to get a seat inside the courtroom. The Courtroom itself was packed. Nobel prize winning scientists Eric Lander and James D. Watson, heads of NIH (Harold Varmus) and NCI (Francis Collins), prominent geneticists, and other researchers, scientists, and policy makers whose work will be deeply impacted by this case were all in the audience. In a test of Myriad’s logic and how far they are willing to go in allowing for corporate control over our very bodies, Justice Kagen pushed Myriad lawyers to take their argument to the extreme extent asking whether human chromosomes are patentable. Myriad replied yes. This is absurd and their reply came close to prompting several gasps in the courtroom. Kagen may not have been aware that the very scientist who discovered the double helix structure of DNA, James D. Watson was himself in the courtroom and he later spoke out against the practice of human gene patents. 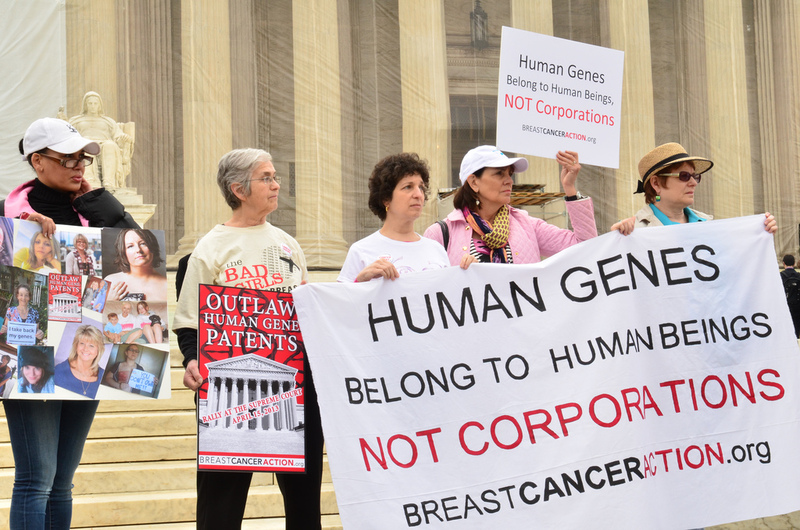 BCAction members at the Supreme Court taking a stand against the patenting of our genes during oral arguments. I felt so proud to stand with our allies and friends and I was truly awed and humbled by the crowd of breast cancer activists supporting the issue outside. What an incredible experience! Well over 50 people from 14 states across the country joined together to stand against human gene patenting. Women proudly held up signs and pictures of loved ones: women with their children, their families, and friends. We were thrilled to stand with decades-long BCAction members as well as people who found BCAction only three weeks ago! We were joined by partner organizations and allies who stand with us in opposition to Myriad’s BRCA gene patents and all human gene patents. Leaders from Friends of the Earth USA, Knowledge Ecology International, FORCE, and METAVivor, joined us and spoke powerfully about the harms that result from Myriad’s gene patent. Standing shoulder to shoulder with so many wonderful people working hard for women’s health was inspiring, and hearing the personal stories from the powerful women was an ongoing reminder that so much is at stake here. We know that Myriad’s patent on our genes is wrong, and we are hopeful that the Supreme Court Justices will take this opportunity to come down on the right side of women’s health. 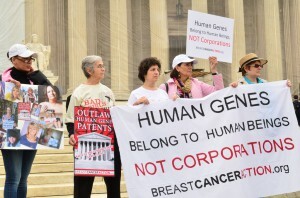 Years ago, Breast Cancer Action was the only breast cancer organization willing to take a stand to oppose the human “breast cancer gene” patents. We remain the only breast cancer organization that is a plaintiff on the case. Thank you for your support and ensuring we are free from any corporate conflict of interest and can always take a bold stand for women’s health. Stay tuned to Breast Cancer Action in the months to come as we look forward to the Court’s ruling. Your ongoing support got us to the US Supreme Court. But we have so much more to do. If you are inspired by how far we have come, and want to make sure Breast Cancer Action has the resources to always stand up to corporate giants like Myriad Genetics, make a generous donation today. P.S. 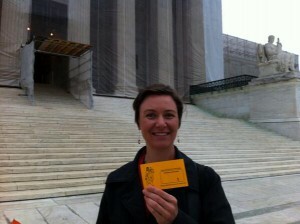 Make sure to read our report from the rally outside the Supreme Court during oral arguments. ← Human Gene Patents Are Wrong. That’s All There Is to It!